The time has come! Yes, that's right, its time to vote! Here are the four selections from this week, now you have to pick your favorite. The poll will run from now through Midnight Sunday Night. We'll announce the winner Monday. Thanks to everyone for participating. Ryetous Rye IPA by Renegade Brewing Co. taken by @beertographer aka Sean Buchan. You can check out more of Sean's photos on his website. So now we have our four selections for the week! Some great shots here. 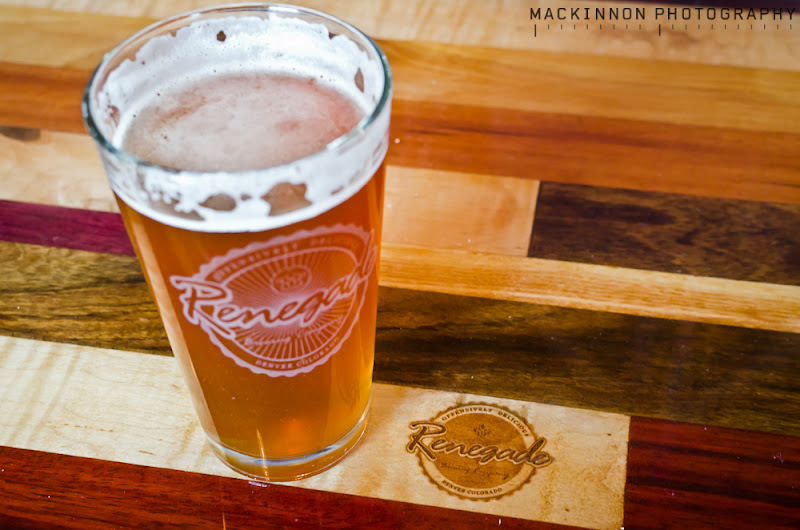 Starting tomorrow morning, we'll open the polls to determine your favorite and that photo will be crowned Beertography of the Week on Monday. Don't forget to email your beertography to beertography@gmail.com or you can just tag your tweet with #beertography and/or mention me @beertography. 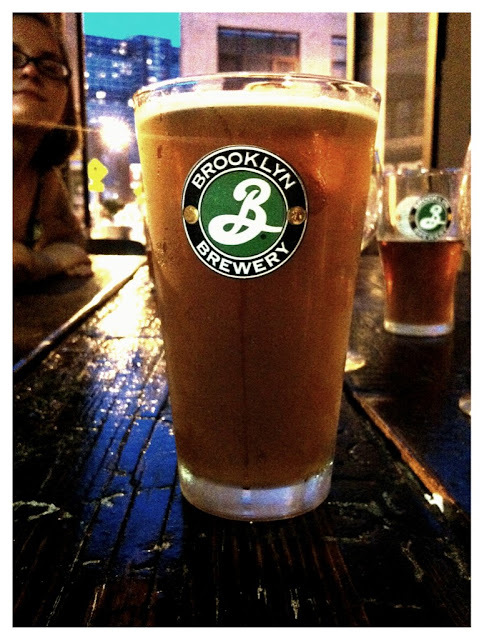 When you submit your photo, please add a short description of the beer and any additional pertinent information. Also include any website/twitter account/flickr page that you'd like me to link to if I end up using your photo. The Concoction by Brooklyn Brewery taken by @jcshithead aka J.A. Caldwell at Barcade Jersey City.You can check out more of his photos on Flickr. We've joined forces with Mike of NewJerseyCraftBeer.com to bring you some New Jersey-centric Beertography! Head on over to NJCB and check out what's going on with our new New Jersey Craft Beertography promotion. You could even win a NJ Beer Co. Hat & Shirt! 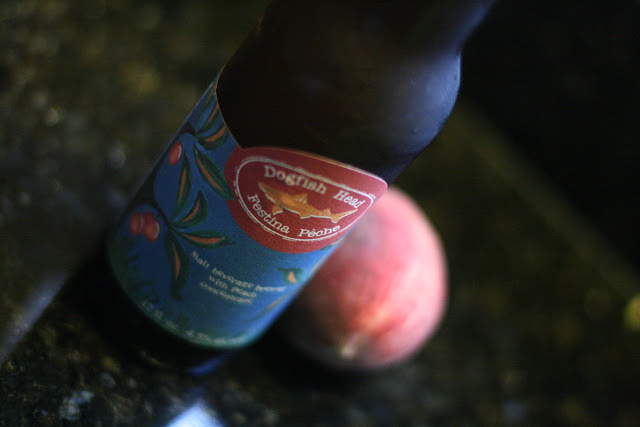 Dogfish Head Festina Peche by Chetan Desai. You can check out Chet's other photography on his Flickr. 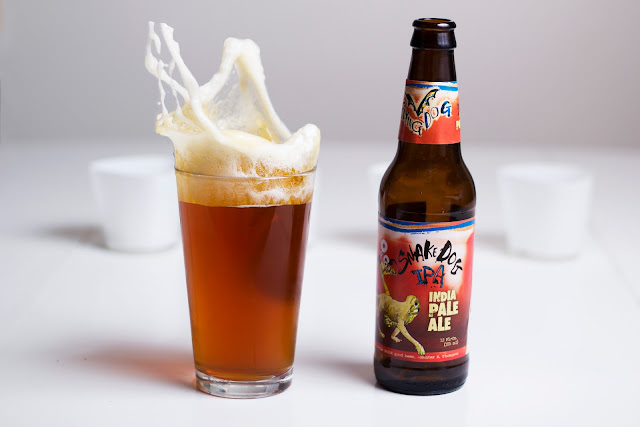 Flying Dog Snake Dog IPA by Ian Sheppard. You can check out Ian's other photography on his Flickr. Hey folks, we're changing things up slightly this week. I've been getting more and more submissions and its been tough to choose just one as the Beertography of the Week since they're all so great. So here's the deal. I'm going to post 1 photo submission per day of my choosing, then at the end of the week we'll have a poll to determine everyone's favorite and that photo will be crowned Beertography of the Week on Monday. Sound good? Above you'll find our first entry. I'm also set up on Google Plus now as well if you've got yourself an account. What's the first thing that comes to your mind when I say Vermont? Mountains? Maple Syrup? Ben & Jerry's? While all of those may be accurate, for me now the definitive answer is beer...and quality beer at that. 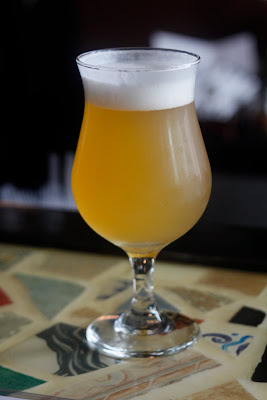 This past June some friends and I embarked upon a whirlwind beer tour throughout the state including stops at Hill Farmstead, a very special visit to Lawson's Finest Liquids, the beer-friendly town of Burlington, Trapp Family Lodge & Brewery and The Alchemist. 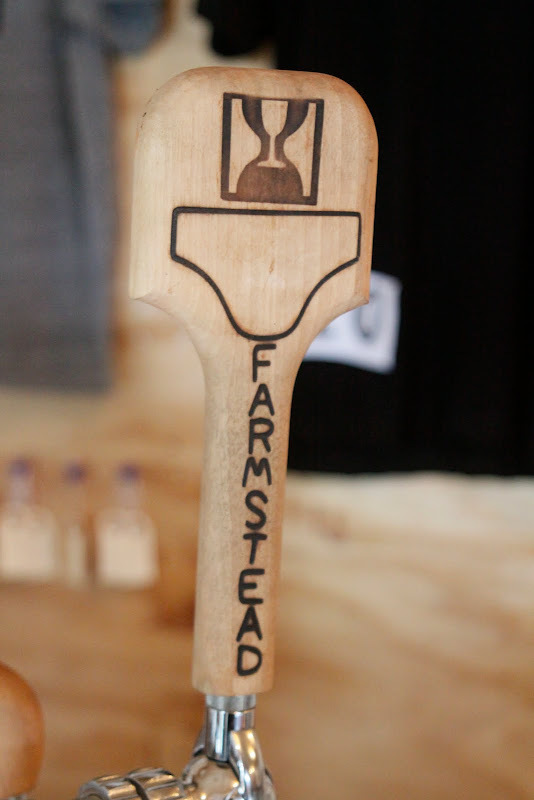 The very first stop on our journey was at Hill Farmstead Brewery in Greensboro Bend, VT. If you don't live in either Vermont, New York City or Philly (the only places they currently distribute), then you may not have heard of this little operation. Trust me though, they are absolutely worth seeking out and/or visiting. Thankfully, we brought a cooler with us to attempt to bring as many bottles home with us as we could. Unfortunately here only two of their wonderful bottles were available, but it didn't matter as their tap list was phenomenal. Hill Farmstead is still in its early stages as owner/brewmaster Shaun Hill just celebrated his first Anniversary back in May. But growth is already necessary. Above you see their new tasting room that will eventually house even more brewing equipment in addition to the neighboring structure that they currently occupy. HF offers a $7 flight where you get to try everything they have on tap. Just DON'T FORGET TO BRING CASH! You'll also notice above that they had a Mikkeller beer on as a Guest Tap. That is actually a beer brewed by Mikkeller in Denmark and sent to Hill Farmstead to help celebrate their 1st Anniversary. Doesn't the world of craft beer just seem like one big lovefest sometimes? My personal favorite draughts here were the Motoeka and the Double Galaxy. Next we drove to Warren, VT and visited The Warren Store. This is one of the few places you can get the elusively delicious beers of Sean Lawson's Lawson's Finest Liquids. We promptly cleaned out the store of nearly their entire supply of Lawson's, which only consisted of the Weiss-K pictured above (photo taken at campsite after it had a few hour cooler bath). Since we were traveling with an industry person, we made a few calls before the trip to see if we could arrange a few special meetups while we around. Amazingly, Sean Lawson himself called us and invited us to come by the brewery, which just so happens to basically be a shed on his family's property. I did not take any photos there as I did not want to abuse this insanely kind invitation, but Sean has really done what a lot of homebrewers dream of. He basically built a tiny nanobrewery out of a shed, got it licensed and is now brewing award-winning beers. Its truly amazing and inspiring. We spent a solid 90 minutes or so hanging out with Sean and talking beer. If that wasn't enough, he also sampled and gave us some advice on our homebrew. Then on top of that, he allowed us to raid his stash of super rare beers. Needless to say, we walked out with WAY more Lawson's than we could have ever expected, including this bottle that just arrived at his home...his collaboration with The Bruery, Acer Quercus. The next day we continued on to Burlington, VT and its wealth of good beer destinations. First we hit The Farmhouse Tap & Grill for an early dinner. This is a great spot with a very cool backyard beer garden if you're just looking for beers and appetizers. That's where we started out while we waited for a table. Then we moved into the main dining room and had the most amazing burgers and fries. If you visit Burlington, this place is a must. The food was fantastic. 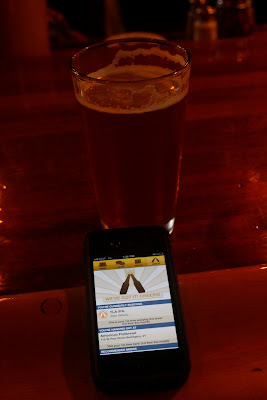 We then made our way over to Vermont Pub & Brewery for a quick beer as it was already nearing evening. This was the place founded by the late Greg Noonan so it was a necessary stop, but we were a bit underwhelmed by the beer. Maybe it was just an off night but it felt like a bit of a relic of the craft beer past. But we were only there briefly so for the most part we reserved our judgement. Our final Burlington stop was American Flatbread where they serve their very own brew line known as Zero Gravity. All the taps are unique at American Flatbread. Faithfully and obsessively checking in on untappd. The final day of our trip brought us to the Trapp Family Lodge & Brewery in Stowe, VT. This huge expanse of land seems like an incredible (and expensive) place to stay, but we were only interested in this tiny structure that houses the deli, bakery and in the basement, the brewery. The beers were traditional styles like Golden Helles, Vienna Amber and Dunkel Lager which were all exemplary. Hop vines growing on the side of the Trapp brewery. We also made a quick stop at The Shed Restaurant and Brewery in Stowe which feels like a real ski lodge type bar but with solid house-brewed beers. We were in and out rather quick, but this seemed like a good place to stop anytime you're in the area for skiing or otherwise. Hey who took a sip already? Next we moved onto The Alchemist Pub & Brewery in Waterbury which has garnered a great reputation for beers like their Heady Topper. The Alchemist is expanding as well and nearly ready to open an additional brewing and canning facility down the road. This was quite possibly my favorite stop of the entire trip. All of the beers were just about perfect and then we got to meet one of the co-owners, Jen Kimmich. She escorted us down to the basement where all of the brewing is done by the other co-owner, her husband John. He showed us around his fermenters and mash tuns and let us pull off a few samples of beers that were just about ready for public consumption. After that, they treated us to a few rounds of beers and we sat down and had an amazing dinner. Both Jen and John went well out of their way to show us around and we were elated by the whole visit. DEFINITELY check out The Alchemist the next time you're in VT.
And finally, we returned home with our bounty. Conclusion: Vermont makes very, very good beer. Hey folks, I'm trying something new with this rendition #beertography of the week. I'm posting three of the submissions I received and you guys will vote on your favorite. So go ahead, view each entry. Then vote for your favorite! Somehow, despite all my pressings and searches over the last several years, Sam Adams Utopias had avoided me. That is, up until a few weeks ago when a package arrived on my doorstep containing a sample 7oz. bottle of the new 2011 version of Utopias! Sure, its not the full retail version, but at a whopping 27%, i was more than happy to have a small sample size. 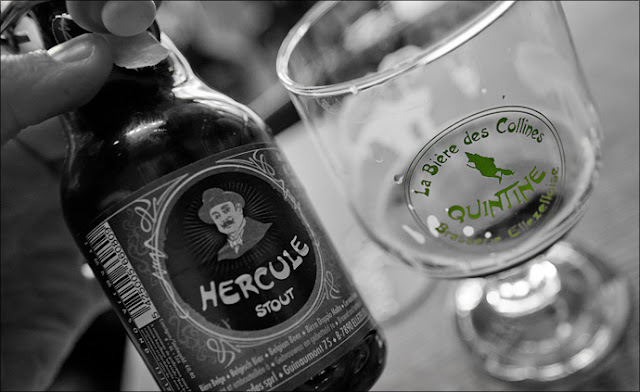 The 2011 version of this barrel-aged rarity pours thick and syrupy with a dark murky color. No head exists, not even for a moment. As I said, I have never had the fortune of trying any of the previous incarnations of Utopias, so I can't compare it to prior versions. The aroma is strong of oaky sweetness with notes of maple and cocoa. This beer may be the utter definition of slow sipper. Try otherwise end up face down on the floor. 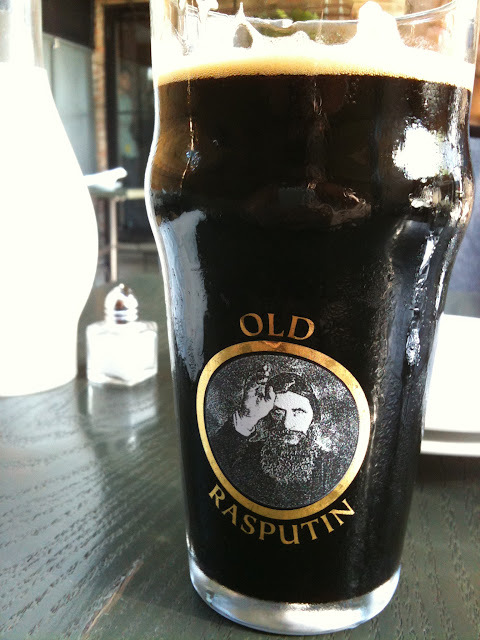 The closest beer I've had to this was the BrewDog Tactical Nuclear Penguin back in May 2010. But this beer is dominated by the benefits of the wood aging. Compared to the Penguin, the Utopias feels more balanced overall. What a big difference there is in the 7 or so percent between Utopias and Dogfish Head Worldwide Stout. But again, that is likely the difference of the barrel-aging and the blending that goes on at Sam Adams. I hope that one day I can get my hands on a full-size bottle of this beauty and store it away for a few years to really get a sense of how such a high ABV beer ages. This week's #beertography of the week is a Double Feature from our friends Stephen C. Van Buren and Scotty Hayes. Obviously the shot above is the wonderful Summertime classic, Bell's Two-Hearted Ale. Two-Hearted is among my top 5 favorite beers that aren't distributed to NY/NJ, so that shot really got me thirsty. 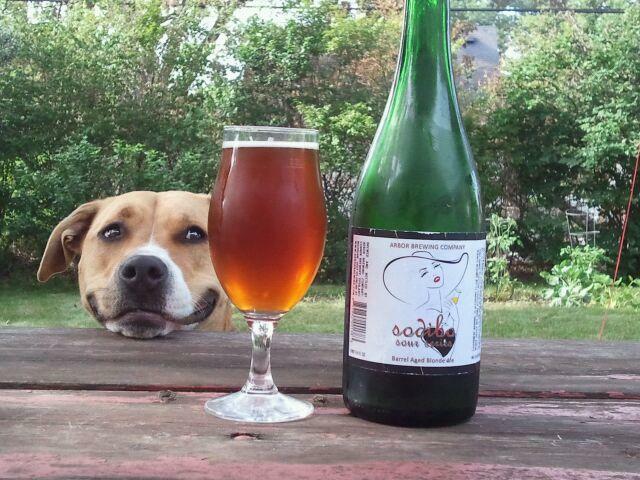 The second photo they submitted here features the Arbor Brewing Company barrel-aged Blonde Ale "Sodibo". It also features one of the awesomest dogs I've ever seen. Check out Stephen & Scotty's other photos here. Don't forget to email your beertography to beertography@gmail.com or you can just tag your tweet with #beertography and I'll save it for next week's entry. The craft can frenzy continues! This time, 21st Amendment Brewery ups the ante and releases their newest entry into the market, Hop Crisis Oak-Aged Imperial IPA. At 9.7% ABV, this is not a beer to consume in mass quantities. 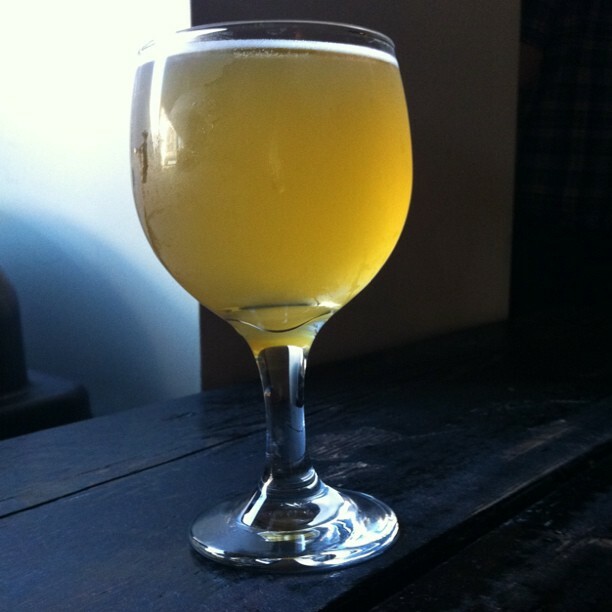 It pours a super clear amber with a sticky, slightly off-white head. Bringing the glass anywhere near your face and you get smacked with the hoppy aromas. The Simcoe hops are the most obvious but the Amarillo are in there as well. Take a sip and its malty and full-bodied. There's a good deal of bitterness up front but that quickly gets balanced out by the malt, only to have the hops kick back in on the back end. No overt oak character, instead it sits slightly muted in the background. On top of all of that, there is little to no alcohol warmth which makes for a fairly dangerous beer. I also really enjoyed how I received the sample of this beer. As you can see in the first photo, whole-leaf hops were used to help protect the can during shipment. Its the little geeky beer things that keep me going. 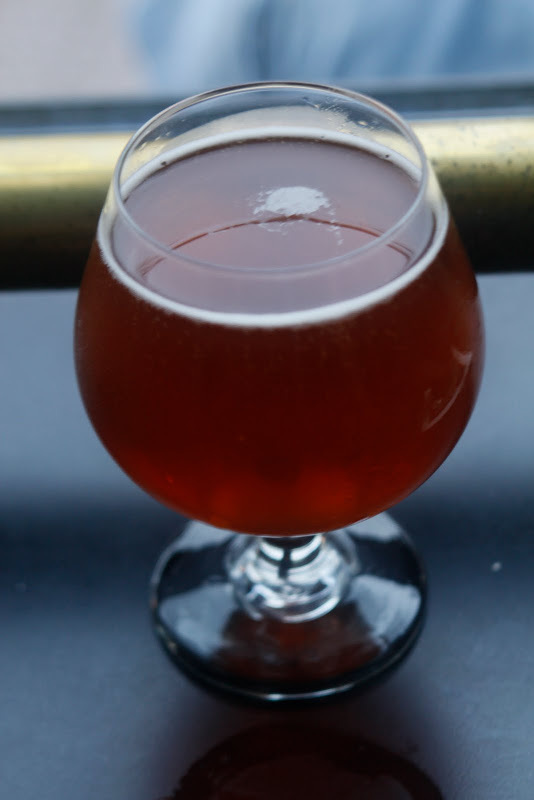 Hop Crisis is the second in 21A's "Insurrection Series", the first being Monk's Blood. This beer is available now in the following states: CA, OR, WA, AK, ID, MN, OH, MA, NY, NJ, DC, MD, PA, VA and GA.
A few weeks ago I was asked to participate in a online webcast launch of Alexander Keith's beers from Nova Scotia in the United States. Having never heard of this brand of beer before, I decided to give them a shot. Alexander Keith’s Nova Scotia Style Lager is brewed with noble hops prized for their subtle, spicy character, and the beer features a deep amber color and a crisp finish with an assertive but clean bitterness. Alexander Keith’s Nova Scotia Style Brown Ale is a classic full-bodied brown ale, with hints of honey and caramel balanced with a fresh hop aroma provided by the addition of cascade hops. Now as it turns out, Alexander Keith's is brewed by Budweiser in NY state. But that doesn't stop these beers from being decent examples of their styles. I found the lager the most enjoyable of the bunch. I think we'll see more and more Budweiser-backed brews enter the market inconspicuously.